The Banner looked to be in the draw for round 4 when they led by four points after 67 minutes. ARMAGH CERTAINLY LIVED by the ‘it’s not how you start, it’s how finish’ mantra in the Athletic Grounds with a fantastic flurry of injury-time scores to stun Clare in the Athletic Gounds. Kieran McGeeney’s side survived kicking 18 wides, and found some late inspiration to book a place in Monday’s All-Ireland SFC fourth round qualifier draw, with a whirlwind 1-4 in stoppage time. Clare looked to be heading through when David Tubridy followed up his own saved penalty to tap the rebound into the net to put the visitors four points ahead after 67 minutes. They still led by three as the game approached the 70th minute, with Armagh’s 18 wides looking like the statistic that would finish their back-door run. However some incredible leadership by Rory Grugan and a match-winning haul of 1-2 from the Armagh subs turned this game on its head right at the death. McElroy’s goal levelled it at the start of six minutes of stoppage time and there a furious flurry of points from Grugan, subs Gavin McParland and Ross McQuillan followed by Aidan Forker put the gloss on an incredible afternoon for Armagh, who are now just one game away from equalling last year’s progress to the All-Ireland quarter-finals. Orchard skipper Grugan had a huge role in the turnaround with three of his six points from play coming in the last 10 minutes in sweltering conditions in the Athletic Grounds. Clare led 0-9 to 0-7 at half time and dominated the third quarter, opening the gap up to five points as the game approached the all-important final quarter. That’s when things got interesting with Andrew Murnin’s smart finish on the turn starting the first Armagh revival. That left them a point behind but Clare thought they’d weathered the storm with Turbidy’s goal. A high challenge by Armagh sub Ryan Owens on Courtney gave Clare a penalty and while Blaine Hughes saved the shot, Tubridy followed up the rebound and tapped it home. 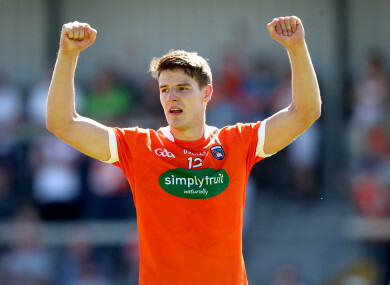 But there was still time for one more twist, with McElroy’s goal igniting Armagh’s furious finish to book their place in the last 12 of the All-Ireland series. Email “Despite kicking 18 wides, Armagh bag whirlwind 1-4 in stoppage-time to stun Clare”. Feedback on “Despite kicking 18 wides, Armagh bag whirlwind 1-4 in stoppage-time to stun Clare”.